Take Control Of Your X-Laser! Created by Pangolin, the world's leading laser software company, laser control software packages sold by your favorite X-Laser dealer will allow you to harness the fullest potential of your X-Laser. Custom text messages, images, graphics, animations, music synched laser show creation and more will be at your finger tips from the very first moments you sit down in front of your computer. Whether you need to create stunning 3D animations or are just starting to learn how to make laser shows, X-Laser offers a Pangolin package for your needs. Whether you are just starting out with X-Laser or have been working with lasers for decades, each software package offers both simplified and advanced controls to suit your needs and comfort level. For those who are brand new to laser, it is as simple as point, click, and party. Right out of the box all of our software comes with more than 2,000 cues ready to roll. Need an animation for Christmas? A New Year's countdown? Or some beautiful aerial patterns? They are already waiting for you. Pangolin's proprietary imaging engine does away with the flip-book style .ild frames in favor of using beautifully smooth algorithms to create fluid projections that maximize the performance of your scanners. 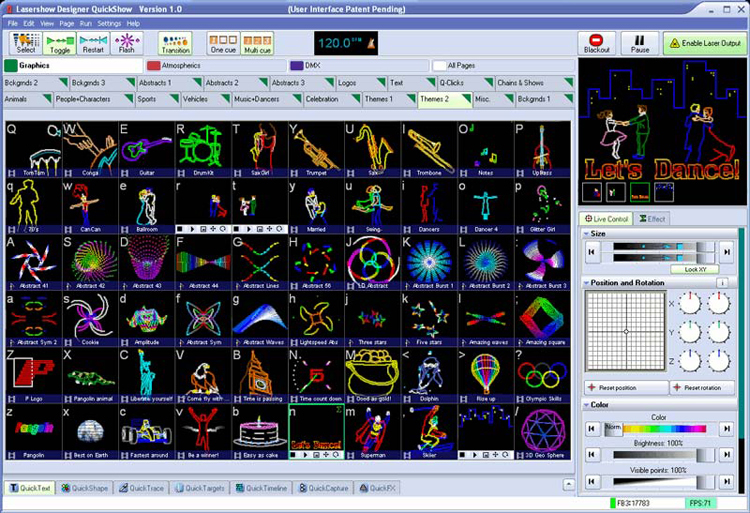 X-Laser QuickShow software features more than 2,000 pre-loaded cues, animations and aerial patterns, the most complete suite of laser control tools on the market. You can also expand the flexibility of your system with the X-Laser XPander which offers four output zones for both Quickshow and Beyond. X-Laser offers a variety of other hardware solutions for laser control such as ethernet and DMX devices. Please contact us if you require a custom solution for your application.